NetNZ Limited is the operational arm of NetNZ. 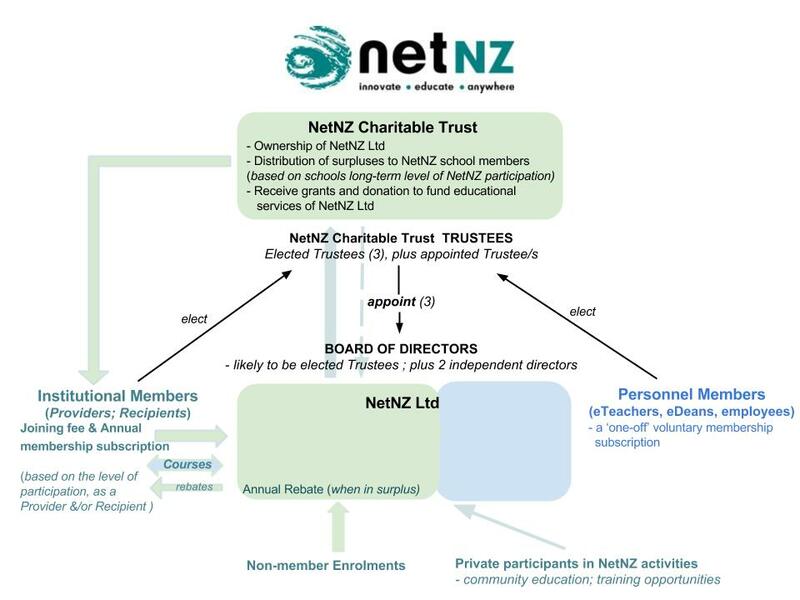 NetNZ Charitable Trust is the sole owner of NetNZ Ltd. The NetNZ board is a diverse group of elected trustees and co-opted experts who together provide strong leadership and governance. Michael Campbell (Board Chair): Born in Northern Ireland, Michael has lived in Christchurch with his wife Mary (a midwife) since 1993. Before migrating to New Zealand, Michael worked in marketing roles for Winemark and Guinness. Michael was also a board member of the King George VI Trust. After 7 years with Corbans Wines in Christchurch, Michael moved to CPIT as a programme manager, piloting e-learning courses and helping develop the Bachelor of Innovation and Entrepreneurship. Since then Michael has been Deputy CEO for Addington Raceway and General Manager of Waipara Valley Winegrowers. Michael was Chairman of St Albans Educare Preschool for 7 years and has been a director of Canterbury United Football Club, Selling Innovation and Pearse and Delaney Wines. Michael was the Innovation Manager at the New Zealand College of Early Childhood Education from 2008 to 2015 and is currently South Island Director of Mindlab. Anne Williams: Anne is a very experienced eDean who has significant institutional knowledge that she has brought to the board. She has experience in leading thinking around effective student support and was previously the staff rep on the CantaNet Management Committee. Anne is passionate about the potential for eLearning in education, and walks the talk – evident in the very strong support for online learning within Ashburton College. Has taken professional learning sessions around eLearning/blended learning at Ashburton College and for Mid Canterbury teacher groups. Bill Feasey (Trustee): Raised in Christchurch, Turangi and Kaikohe, Bill graduated from Otago University with a BSc in Physiology and a BA in History and English. A two year spell with Volunteer Service Abroad followed, teaching in the Himalayan kingdom of Bhutan. Since setting up house in Twizel with wife Suzanne in 1989 Bill has become Principal of Twizel Area School and served two terms on the Executive of the New Zealand Area Schools Association. He was the Area Schools representative on the Secondary Principals Council of New Zealand and in that time also worked on the Ministry of Education’s EOTC reference group. Bill’s interest in NetNZ is to see it be at the forefront of providing high-quality learning for students and schools anywhere and at any time. Maurie Jackways (Trustee): Maurie was first involved with e-learning as Principal of Mount Aspiring College, Wanaka, when OtagoNet was formed in 2001 and later through the role of Lead Principal of OtagoNet. In 2008/9 Maurie was seconded as a Leadership and Management Advisor at the University of Otago College of Education working in the First Time Principals Programme before moving to Auckland as the Foundation Principal of Ormiston Senior College in 2010, New Zealand’s newest secondary school at the time. Stuart Dillon Roberts: Stuart is regarded as a specialist in the development of digital strategies in New Zealand, having developed regional strategies for Dunedin, Otago and Canterbury as well as advising other local authorities on the economic, social and educational benefits of digital and online technologies. His passion for community initiatives resulted in the Digital Office, a not for profit company that leads digital projects with a focus on increasing digital literacy, expanding access to the Internet and improving economic growth by maximising the use of the Internet as a business tool. The Digital Office has projects operating in communities, schools and businesses and recently oversaw Dunedin’s winning 12 month Gigatown campaign. Stuart is also the founder of Digital Journey and the digital assessment service that helps businesses, organisations and schools increase their digital skills and knowledge of the Internet. These services operate internationally and helped thousands of businesses and individuals maximise online technologies.